This only works with our standalone pop-ups—not pop-ups that are attached to a page. To learn more, check out Creating a pop-up. Some pop-up publishing methods below require our Leadpages WordPress plugin. If you haven’t installed the plugin yet (or are using a version below 2.1) you can follow our installation instructions here. For an overview of pop-ups (and the different types you can use), see How pop-ups work. All standalone pop-ups can be published via the HTML code produced in the Publishing Options of the pop-up, accessible either in the builder or from the Conversion Tools > Pop-Ups dashboard under the actions menu more. This method does not require our WordPress plugin. Learn more on where to find your pop-up code. 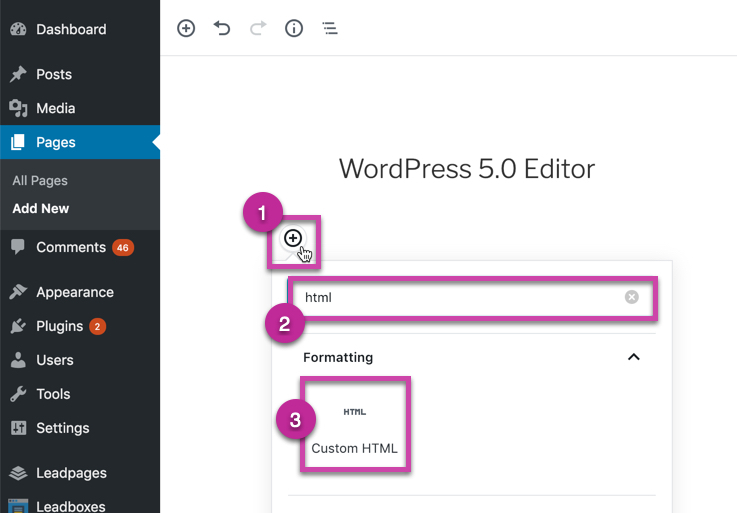 WordPress 5.0 is WordPress' newest editor, which gives users the ability to edit their posts by using blocks to arrange content. Once you've got your pop-up code, when editing your post or page (or creating a new one) in WordPress 5.0, add a Custom HTML block where you'd like the pop-up to show up on your page (if it's a timed popup or exit intent pop-up, it doesn't matter where you place the block on your page). Once that block has been added to your WordPress page or post, paste your pop-up code into the HTML code block. WordPress Classic Editor is WordPress' legacy editor and will be supported by them until 2021. If you're running a version of WordPress prior to 5.0, you're likely using the Classic Editor. Once you've got your pop-up code, while editing your post or page (or creating a new one) in WordPress, be sure to switch over to the Text editor, which will allow you to paste in HTML. Then, paste in the code for your pop-up where you want it to appear in your post, as shown below. In order to add a pop-up to a WordPress widget, you'll want to have your pop-up publishing code handy, either as a plain text link, button, or image pop-up. Learn more here on how to access that code here. Copy your entire pop-up publishing code, then navigate to Widgets under Appearance on the left-hand sidebar of your WordPress editor. Select a Text widget, then make sure you're in the Text tab of the widget editor. Paste the pop-up code and Save your widget. ​NOTE: Only Standard pop-ups are available as shortcodes at this time and you must have the Leadpages WordPress plugin installed. To publish Drag & Drop pop-ups, you’ll need to copy and paste your code, as described here. Create a new page/post, or edit an existing one. In the Visual editor, position your cursor wherever you’d like your pop-up, such as at the end of your post. Click the Leadboxes drop-down menu icon and select your desired pop-up. Repeat the steps above to add as many pop-ups as you’d like to your post. Your pop-up will use whatever publishing settings are currently saved within Leadpages. To publish a button or image pop-up using our shortcodes, simply adjust your publishing settings within Leadpages and save them. 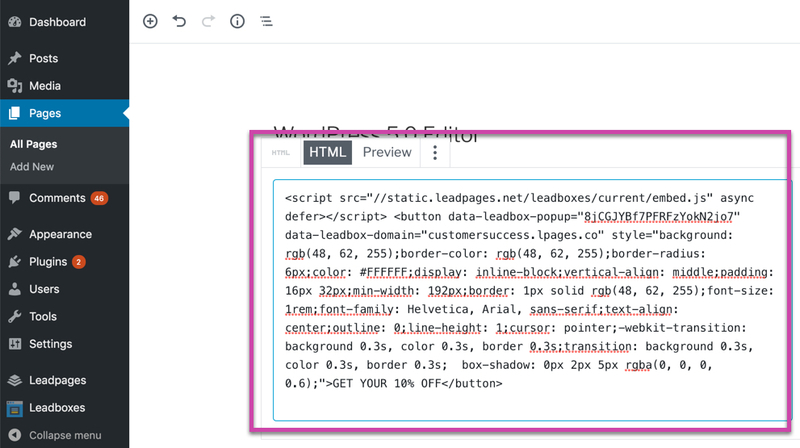 WARNING: When you make changes to your pop-up's publishing options within Leadpages, updates will automatically be reflected in WordPress when using the plugin. To publish different styles of the same pop-up (e.g. as a button on one page and text link on another) we recommend duplicating the pop-up and adjusting publishing styles independently. Our plugin allows you to publish timed or exit pop-ups globally to your site—so all your pages can instantly call visitors to action. You can also publish timed and exit pop-ups to individual pages. Follow the steps below to learn how. 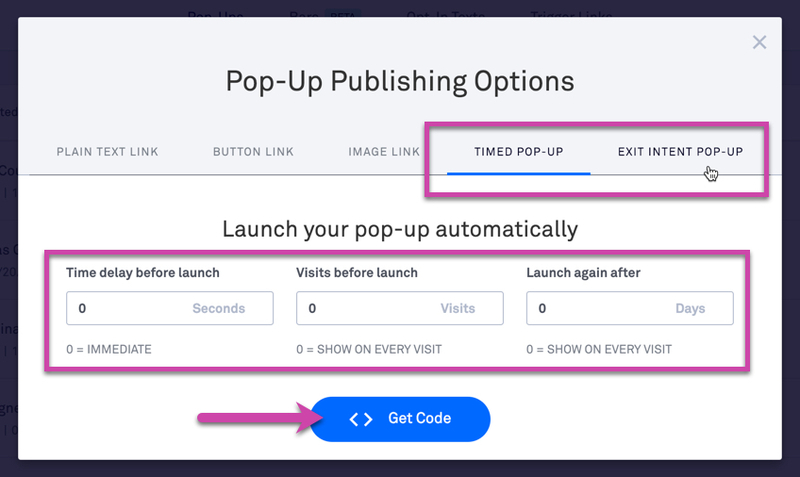 To publish a timed pop-up or an exit pop-up to WordPress, you’ll first need to configure and save those settings in Leadpages. Click Publish Options from your pop-up's action menu, then choose your desired options from the pop-up, as seen below. Click Leadboxes in your WordPress Dashboard’s sidebar. Select your pop-up from the timed, exit, or both sections. If you don’t see your pop-up, check to ensure you’ve set timed or exit options within Leadpages, then click the refresh button. Decide if you want your pop-up to appear on all pages, posts only, or pages only. Note that only one global timed or exit pop-up can be active at a time. NOTE: To use a Drag & Drop pop-up, you’ll need to select the “Paste Drag & Drop Leadbox” option, and paste in your pop-up's code as described in our article: Publishing your pop-ups. If you want a different pop-up to show up (or none at all) on a particular page, you can use the page-specific publishing options. To publish page-specific timed and exit pop-ups, use the Leadbox widget when editing your page. Create (or edit) a page or post in WordPress. In the sidebar, select your timed and/or exit pop-up from the Page Specific Leadbox panel. When you publish or update your page, your timed/exit pop-up will be there. You can also use a global pop-up if you’ve set one up, or select “None” to prevent any timed/exit pop-ups from appearing on your page. At this time, only Standard timed and exit pop-ups are available from page-specific drop-downs. You can publish Drag & Drop pop-ups following our guide here: Publishing your pop-ups. Why does my pop-up appear in a new window at a Leadpages URL on mobile? Pop-ups on mobile automatically open in a new page in order to support the widest variety of mobile devices possible—so you don’t miss out on opt-ins from visitors using older devices. Why doesn’t my timed or exit pop-up show up on mobile? Exit and timed popups are disabled on mobile. One reason is to ensure your site’s SEO isn’t negatively affected by pop-ups—Google and other search engines may boost sites’ search rankings that avoid using timed popups on mobile. Also, most internet browsers block popups on mobile. How can I add a timed or exit pop-up to a Lead Page? 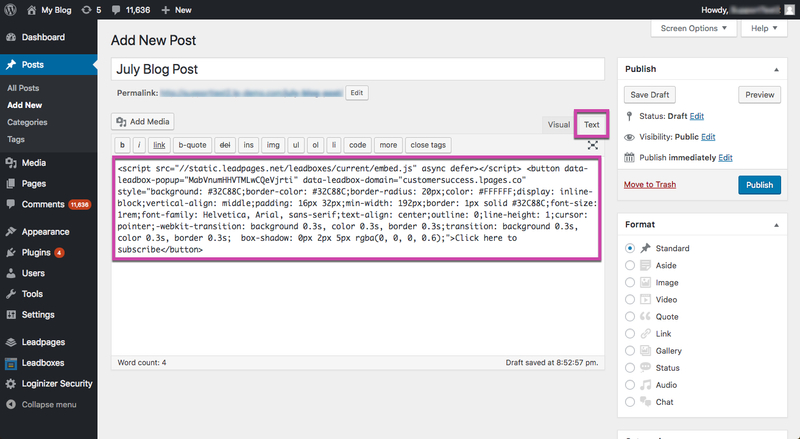 Since Lead Pages aren’t quite the same as normal WordPress pages, the Leadbox plugin does not interact with them. Instead, you can add your exit or timed pop-up HTML code to your page’s tracking code head section. See our guide here for instructions.